When we got off the Sea Plane in New York we heard that Jefferson Starship was giving a free concert in Central Park that nite, and so went there. While strolling amongst the concert-goers, we made friends with a couple from Boston who were heading back right after the concert and offered us a ride. Pretty easy hitchhiking so far we thought. So happened that Boston was where “The Tall Ships” had docked. The Boston couple invited us to spend the night in their spare bedroom and we made love just the way you have to do it when your kids are sleeping in the next bedroom – really whispering and holding your breath instead of screaming. After seeing the tall ships in the morning, we put our thumbs out on Hwy. 83 towards my sister’s place in East Colebrook, New Hampshire. The following afternoon we got a ride from somebody going to the Kennebunkport (Maine) Dump Festival. Once a year everyone gathers up their old junk to put on floats and parades to the Dump. Yes, the Queen of the Parade sat on a throne – an old toilet bowl. 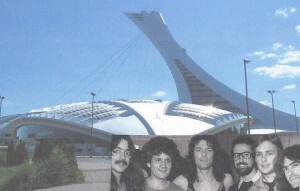 The next day we arrive in Montreal, but the Olympics are not as great as we’d hoped. We couldn’t even get within seeing distance of the Olympic Village without having to pay big money. So we skip that for our own walking tour of the City and learn that Montreal is French for Mont Royal, and there really is a Mont Royal (with free camp sites) within walking distance from the downtown Canadian Pacific train station (which had showers to rent for 50 cents). So our stay in Montreal was pleasant even without enjoying any Olympics (except for our own in the shower).